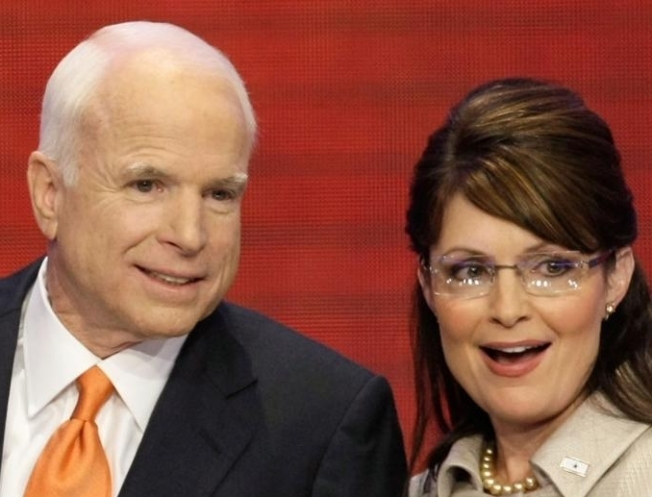 John McCain and Sarah Palin are trying to invigorate the base. Sarah Palin was chosen to be John McCain's running mate in large part because he knew she would appeal to the Republican Party's base. His plan may have worked a little too well. Alaska Gov. Palin whipped the RNC crowd into a frenzy last night, wowing the delegates with the story of her ascent through the political ranks, her crusades against corruption, her beautiful family and a surprising willingness to lower both barrels at Barack Obama. Now McCain, never known for his eloquence before a large audience, has to clear the rather high bar set by Palin. When McCain is addressing the base he often runs into trouble. At the Conservative Political Action Convention in February, organizers pleaded with attendees not to boo McCain, who had just achieved frontrunner status following Super Tuesday. It was to no avail, as a cascade of boos descended on McCain at the mere mention of the word "immigration," an issue on which he had been at odds with the party. McCain has been a darling of the American press for more than 25 years, earning their loyalty and friendship by answering all their question and palling around with them in bars and buses across the land. On the campaign trail McCain feels most comfortable in intimate "town hall" settings where he can work the crowd, a jovial smile on his face and a microphone is his hands. Tonight John McCain must find a way to connect with a large room filled with people with whom he's had an often shaky relationship. If he's plays his cards right, they'll set aside their differences and an embrace the man who brought Palin to the party. You can be sure among his opening remarks will be "How about that Sarah Palin?"